The number of natural disasters in the USA in 2018 declined from 2017, and the amount of damage they did also declined. Figure 1. Source: National Centers for Environmental Information, 2019. Since 1980, there have been 241 severe weather and/or climate events in the USA that have caused damages exceeding $1.6 trillion dollars. The most important of these are the “billion-dollar disasters,” events that caused damages in excess of $1 billion. Figure 1 shows the data. The columns represent the number of events, with each color representing a different type of event. The black line represents a moving 5-year average number of events. They gray line represents the cost of damages, in billions of dollars. In 2018, there were 14 billion-dollar disasters. That is more than double the long-term average. The 4 years with the most billion dollar disasters have all occurred in the last 8 years, and the last 3 years have ranked #1 (tie), #3, and #4. The last 3 years have been significantly higher than any other years except 2011. The increase comes primarily from severe storms, a category that excludes hurricanes and tropical cyclones, flooding and winter storms. These are tornadoes, thunderstorms, hail, and similar kinds of storms. The estimated CPI-adjusted losses in 2018 were $91 billion. That’s quite a chunk of change, but it much less than the costs in 2017 ($312.7 billion), 2005 ($220.8 billion), or 2012 ($128.6 billion). 2017 was a terrible year (see here): Hurricanes Harvey, Irma, and Maria struck in 2017, and not only was it far-and-away the most costly year, it also tied for the highest number of disasters. Hurricane Katrina struck in 2005, and Hurricane Sandy struck in 2012. Hurricane Katrina is still the single event that caused more damage than any other, followed by Hurricanes Harvey and Maria. Last year, the most costly natural disaster was the series of wildfires in California, especially the Camp Fire. The fires caused an estimated $24 billion in damage. 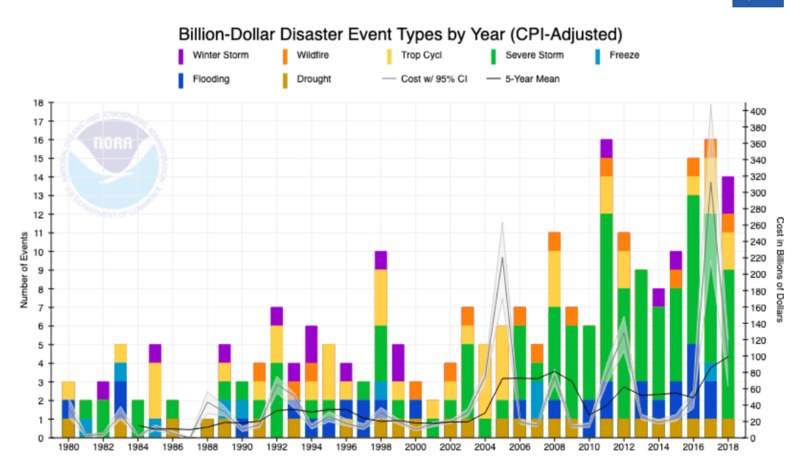 Looking at Figure 1, starting somewhere around 2005, the number of billion-dollar disasters starts to trend upward. The amount of damage does, too, though the variation from year-to-year is much greater. The National Centers for Environmental Information, which keeps this data, factors the Consumer Price Index into it, so the change is probably not due to inflation. Three factors probably account for most of the increase. First, climate change has caused an increase in the amount of energy in the atmosphere, energy that is available to power more and bigger storms. I once calculated that the increased radiative forcing from climate change was equal to the energy output of 1.6 million nuclear power plants. (See here) That’s a lot of energy available to power storms. Second, climate change has caused an increase in droughts throughout the western United States. Even in years like this one, when there has been an abundance of winter snow, the warm temperatures cause the snow to melt earlier in the spring, and they dry out the land faster during the summer. The result is a tinder box, perfect conditions for huge wildfires. And finally, we keep putting ourselves in harm’s way. Development has increased along the Atlantic and Gulf Coasts, where it is in the path of any hurricane that comes ashore. Development has also increased along the fringes of forests, where it is vulnerable to wildfire. And even in the middle of the country, sprawl has increased the built-up area, making tornadoes more likely to grind over it, as opposed to farmland. Missouri was in the region damaged by some of the big weather events of 2018, so the next post will look at how we fared here in the Show Me State. The National Centers for Environmental Information Billion-Dollar Weather and Climate Disasters portal has 5 pages available, and I used them all for this post: Overview, Mapping, Time Series, Summary Stats, and Table of Events. Downloaded and viewed online 4/3/2019 at https://www.ncdc.noaa.gov/billions. By mogreenstats in Climate Change, Weather Patterns on 2019/04/11 .